Since 1857, the Central Highland town of Buon Ma Thot has been home to the finest coffee bean supplies for Vietnam and the world. 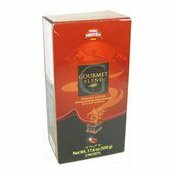 Gourmet Blend, a premier offering excelling in an exquisite flavour and subtle aroma, is the prominent end-result stemming from a stringent selection of flawless coffee beans and an exotic secret brewing formula. Gourmet Blend delivers the combination of tastefulness and genuine energy for your creativity. Put 3 tablespoons (about 20g) of Gourmet Blend Coffee into the filter. Gently shake and lock the coffee press inside. Pour 20ml boiling water 205F-212F (96C-100C) into the filter. Wait until the coffee has fully absorbed water. Add 45ml of boiling water more into the filter. Place the cap. Wait for 5 to 7 minutes for the coffee to drip through the grinds. Note that the coffee must drip slowly in order to capture the pure coffee essence. You may add sugar to condensed milk to taste. Enjoy your cup of Gourmet Blend Coffee! Ingredients: Arabica, Robusta, Cantimor, Excelsa.